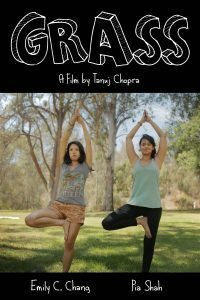 Sundance alum Tanuj Chopra’s award-winning comedy Grass, an entirely improvised feature film, will screen as a part of the Arclight Presents…Slamdance Cinema Club 2017. Screenings will take place at the ArcLight Hollywood on December 10, 2017 at 8:00pm and at the ArcLight Chicago on December 12, 2017, at 7:00 pm. The Los Angeles screening will be followed by a cast and crew Q&A moderated by comedian Jenny Yang. Emily C. Chang (The Vampire Diaries, The Bold Type) and Pia Shah (Grey’s Anatomy, Agents of S.H.I.E.L.D.) star in this arthouse stoner comedy about two women tasked with delivering a backpack full of marijuana. Instead, they find themselves stranded in a park where they spend the day contemplating love, life and pizza. The film was directed by Tanuj Chopra (Chee and T, Punching at the Sun) and executive produced by Alex Rubens (Key and Peele, Rick and Morty, Keanu.) Chopra was recently selected as a fellow of the 2017 Sony Diverse Directors program and is also an alum of Fox’s Global Directors Initiative. Grass is distributed by Comedy Dynamics, one of the largest independent comedy production and distribution companies, producing Kevin Hart’s Guide to Black History for History, Animal Planet’s Animal Nation with Anthony Anderson, the new scripted comedy on Seeso, There’s… Johnny!, History’s Join Or Die with Craig Ferguson, MTV2’s Wild ’N On Tour, and Hulu’s Coming To The Stage. The company has worked with a wide range of established and emerging comedic talent including Kevin Hart, Louis C.K., Aziz Ansari, Jim Gaffigan, Katt Williams and many more.